If I recall correctly, the window for reading My Antonia closes around the time a high school student gets a learner’s permit. Read old time-y novel filled with chores and wind burn. Write essay about what makes this title character such a big-league muse to the protagonist. Earn a B, no plus, no minus, just B. Shelve novel next to The Red Pony, and put another notch in your American Canon head board. Buy a braided keychain. Fill car with yelping teens crunk on blue Mr. Misty Freezes and forget this ever happened. 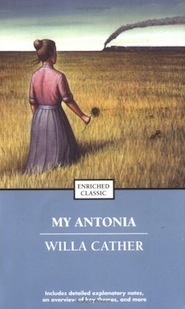 For those of you who had mono the Willa Cather semester: My Antonia is the story of a young Czech girl and her family who arrive in a small Nebraska town at the same time as the narrator, Jim Burden, who has gone to live with his grandparents. Turns out they’re neighbors! Jim’s grandparents are faring well financially, but Antonia’s family is new to farming and they struggle through their first winter. The kids forge a long lasting friendship, through matching moves closer to the city, a crazy summer of dance parties and their eventual split when Jim goes off to Lincoln for college and Antonia stays closer to home. Lots of coming-of-age, lots of colorful Old West visuals, prairies and red waving fields and the like. All told from the perspective of an adult version of Jim, remembering back to this fiery, hard-working, awesome dancing, lovely toughie who captured his interest. Blah, blah, blah. It’s nice. But. Lena Lingard is where it’s at. This just-slightly-more-than-fringe-character, a friend of Jim and Antonia’s, is my favorite. She’s a recent immigrant, too, and when she starts to develop, there isn’t a prairie wind strong enough to carry away her dizzying pheromones. Lena also moves to town to hone her sewing skills, working so she can send money back to her family on the farm.